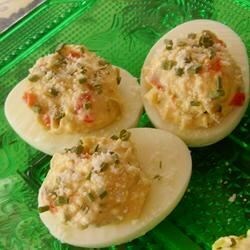 "This is a delicious and fancy variation of the classic Easter appetizer. The prosciutto adds a wonderful saltiness and goes beautifully with the eggs." Place eggs in a large pot and cover with cold water. Bring water to a boil and immediately remove from heat. Cover and let eggs stand in hot water for 10 to 12 minutes. Remove from hot water, cool and peel. Slice the eggs in half lengthwise and place the yolks into a bowl and mash with a fork. Set aside some of the Parmesan cheese and chives to use as a garnish. Mix the remaining into the yolks along with the prosciutto, green olives, red bell pepper, Dijon mustard, sour cream, mayonnaise, hot sauce, garlic powder and pepper. Spoon the yolk mixture back into the egg white halves. Garnish with reserved Parmesan cheese and chives. Good but a lot of effort. Great recipe, good flavor! I will make these again.